Pannacotta as we know,is an Italian dessert made by simmering together cream,,milk and sugar mixing with gelatin and let it cool until set.But now its become a little more elaborate by adding a fruit topping or chocolaty topping to it.I tried it with dates and added cocoa for color and flavor.The two blended nicely and served is a very delicious dessert.Keeping this recipe as base,you can modify it to your favorite topping.It works great as it can be prepared ahead to serve guests and you can layer in your own desired way.I just kept it simple with a dates layer giving it a healthy touch.Hope u all will give this a try and enjoy at home !! 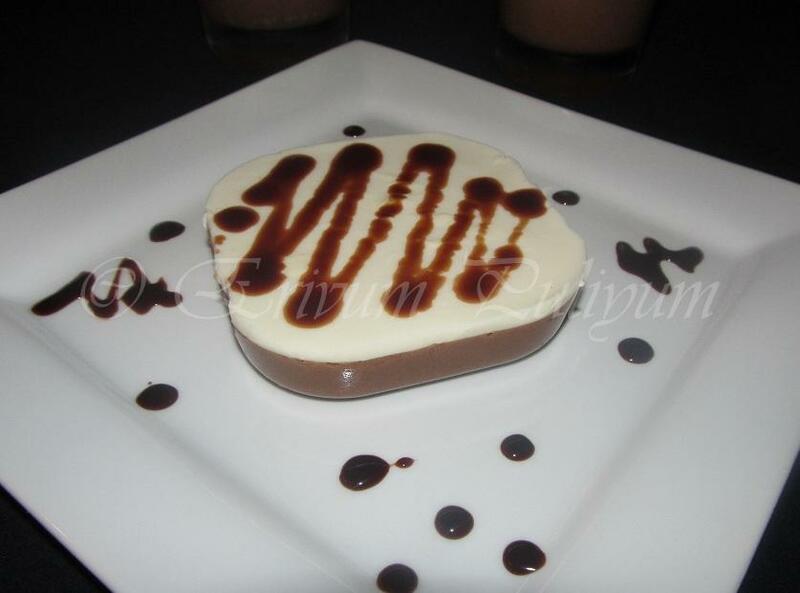 -Microwave dates with milk for a minute or until soft.Blend it in a blender when cooled to smooth paste. -Let it cool and then add it to dates mixture. -Pour into glasses by dividing equally and leave space for next layer.Refrigerate for 1- 2 hours. -Dissolve gelatin in very cold water.leave aside for 10 minutes. -Heat the cream, sugar & vanillla essence,don't boil.Stir until sugar is dissolved on medium heat.Remove from flame.let it cool. -Wait to cool and then add to cream mixture. -Pour on top of the already set dates layer. -Refrigerate for another 2 hours. * You can prepare the next layer after the first layer sets or else the gelatin in the next layer will start to set in the bowl at room temperature and you may not be able to do it properly. * If you are a vegetarian ,you can use fruit pectin instead of gelatin. * This recipe gives a very mild flavor of chocolate in it,if you wish more chocolaty taste then add a little more cocoa powder. * The dates can be soaked overnight too and the blended paste should be very smooth. 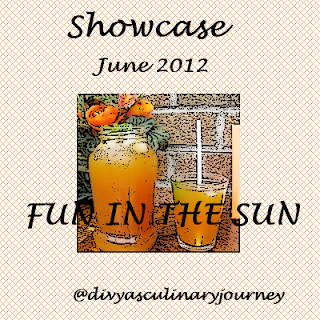 Looks yummy...another recipe to try from your space.. It looks so decorative and perfectly made..I'm sure it will be eqally delicious in taste too. Delicious Dessert, loved the presentation!! Liked ur presentation Julie.Have tried panacotta few times,but never dared to unmould it from the dish..urs came out so well,holding the shape beautifully..good job ! 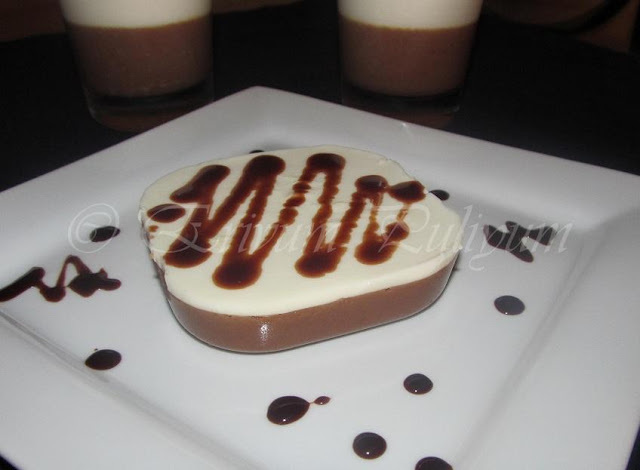 Panacotta with dates sounds awesome Julie. What a unique flavor setting for panna cotta- very nice with dates I'm sure. Most pretty presentation Julie. Love this! I've tried strawberry panacotta and almond panacotta. This would be next on my list. 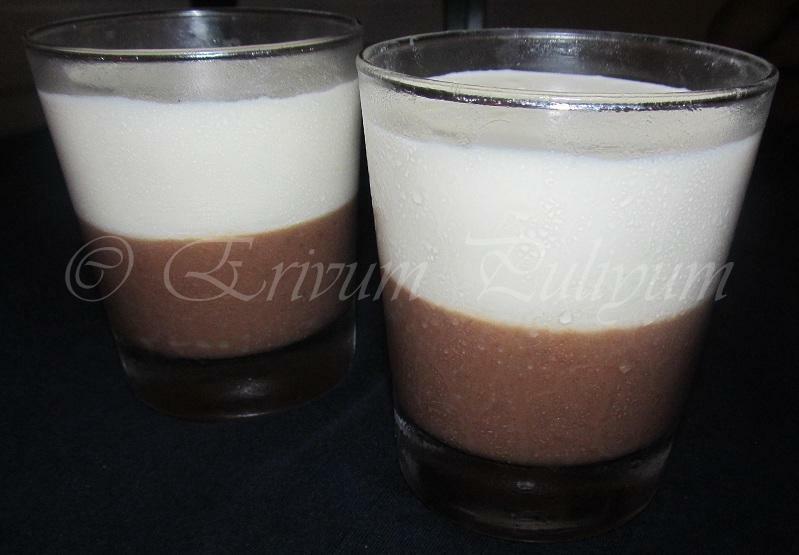 wow.. incredible and perfectly made..
Looks so delicious...wish I could have a glass of that..
Wow, wow, simply superb and tempting..
drooling.. love the concept of pannacota with dates!! Dates pannacotta - wow ! I love pannacotta, but me and gelatine aren't exactly best friends...will definitely give this a shot...sounds really yum ! Yummy and a fusion food! 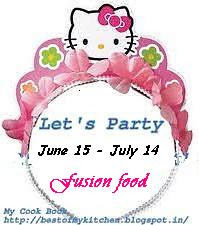 :) Am guilty for scouring the blogs for potential entries for my ongoing event - please consider this as an invite to submit for my ongoing event "Let's Party - Fusion food" :) Thanks! This is delicious and beautiful looking dessert. Very unique one Julie, never thought of pannacotta with dates. Looks gorgeous & yum!! Very interesting recipe too! wow...Julie very interesting and delicious looking dessert,great recipe dear...will try it for sure!! enikku vaya...ethu kalakki....looks so perfect and yummmy! !